Janet had her first official workout at H2O today. Alyssa had taken her through a routine yesterday to familiarize Janet with the equipment and see what she could do on each piece. 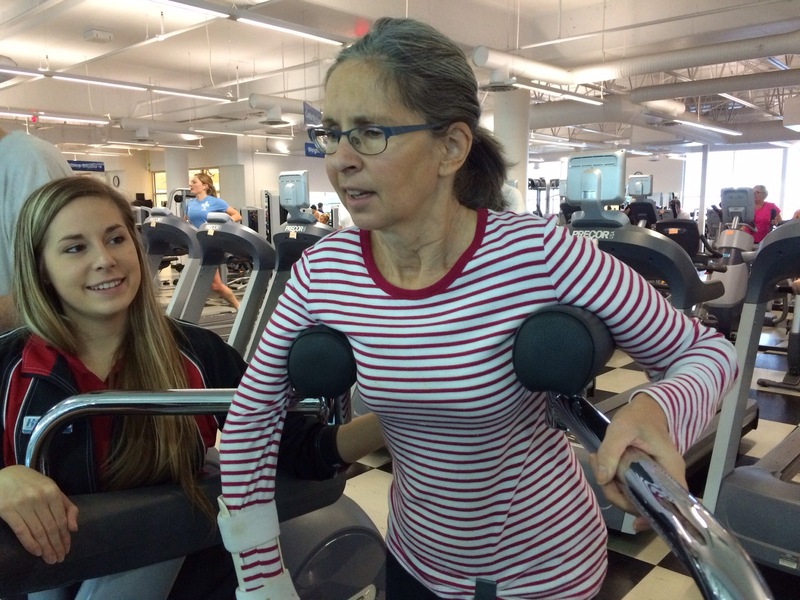 The program’s focus is the same as Connect’s with an emphasis on building leg strength and the goal of improving Janet’s walking. There is no Shuttle machine at H2O so that work will be done on two leg press machines that will be hard for Janet to use as they both pretty much require two legs to work them and Janet’s right leg doesn’t work that way. She’ll give it a try holding out hope that by helping the left leg a little bit the right one might kick into gear more. The recumbent bike at H2O is way cooler than the one at Connect except for the pedals. This is a recurring problem as every other bike we’ve seen has pedals too small to strap Janet’s right foot onto. Alyssa came up with the idea of putting a band around Janet’s legs to prevent the right one from flailing outward like it wants to. This enables Janet to push harder with her right leg therefore keeping it on the pedal. So far so good and Janet likes the idea of being able to watch tv while riding. Now if there was only anything on worth watching. 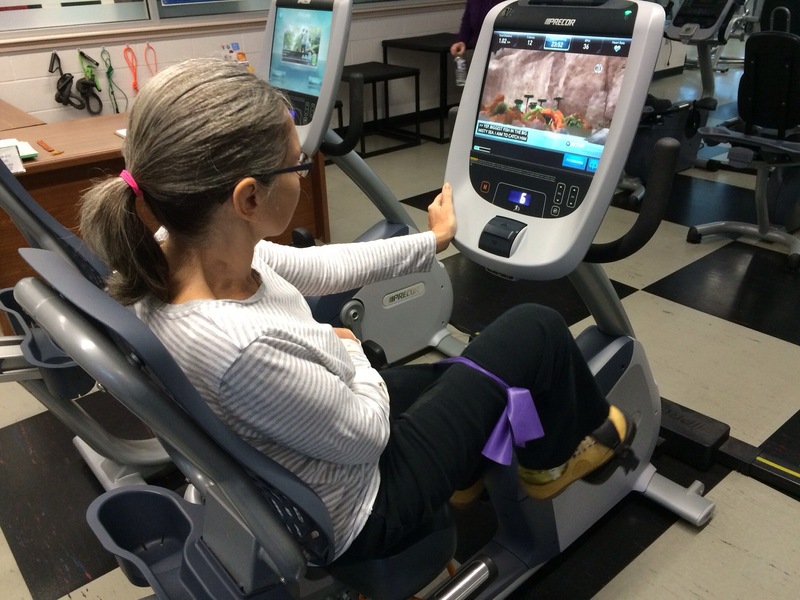 Another new piece of equip for Janet surprisingly is a treadmill. H2O has one with a couple of arm supports that let Janet concentrate on taking nice long steps without worrying about balance. It’s a brilliant idea that I think will really improve the mechanics of Janet’s walking. One other surprise from our visits to H2O so far is that Janet hasn’t uttered the words terrible or awful once. She also accepted the challenge of taking the stairs today instead of the elevator and did great both up and down. The at home routine is improving as Janet is going to bed at Connect type hours and getting up early enough to have productive mornings. There has been only minor complaining about helping out and no thought of using her cane. On Monday we did a Superstore run and Janet pushed the buggy around the entire store with minimal help. She was exhausted afterwards, it’s a big store, but I could tell she felt good about being able to do it. During her nighttime recap of the day she listed that in a very positive way. I like being able to incorporate therapy into daily activities. Praying that Janet continues to adjust positively to being at home. Nine hundred eighteen days ago Janet suffered a ruptured brain aneurysm that kept her in hospital then a rehab facility until today. I asked Janet if she was thinking of today as a day of lasts or a day of firsts and she quickly responded lasts. She couldn’t wait to get out of Connect and reminded me throughout the day that we don’t have to do this anymore and don’t have to do that anymore. There were lots of fist pumps, whoo hoo’s and huge smiles. Goodbyes are difficult for me so I was glad that Janet handled those today. I’ll be better at it next week when we go back for a farewell lunch. Janet gave everyone a nice hug and thank you as we departed this afternoon with the only emotion being happiness although she did admit in the car that it was a little sad to say goodbye as “they are good people”. Indeed. 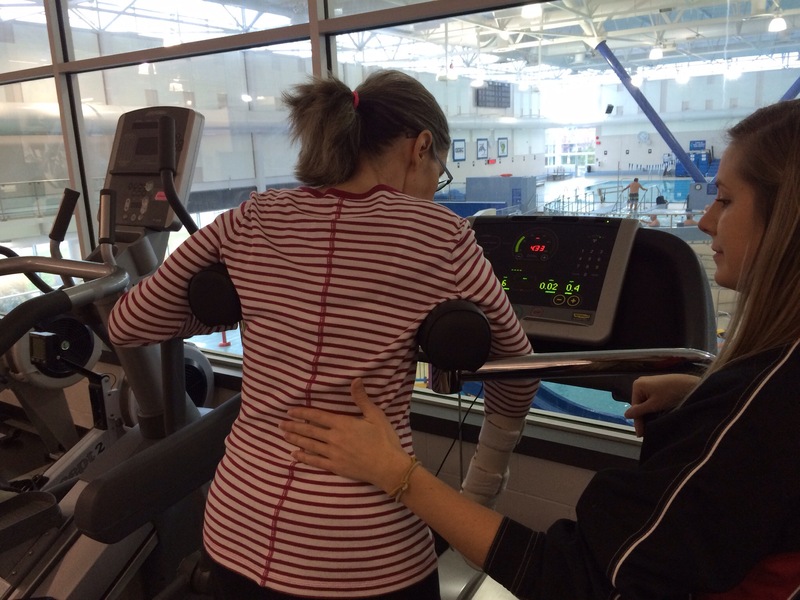 This was not the start of any vacation for Janet, we had an appointment with Alyssa at H2O right after a quick lunch and she put Janet through a little fitness assessment so she can start building a program for her. Janet seems impressed with the facility and likes Alyssa so for the time being it looks like working out there a few times a week will be fine and may even include some pool time. Janet has agreed to try that once. Tuckered out after the emotion of her last day at Connect followed by the fitness assessment Janet enjoyed a good nap before dinner then we took off for the church and the last SheLife session until the new year. Janet is grateful for the love and support she gets from her table mates and took a lot of compliments about her baptism testimonial tonight. She came away from the evening feeling pretty good and was quick to remind me that we were going home not back to Connect. Deserving of a treat, Janet stayed up a little late to watch The Voice and have some ice cream. Now she is snuggled up in her own bed in her own home ready to begin a new chapter. Praying for a restful night of sleep and an energetic Thursday. This morning, Janet successfully picked up Garrett’s phone from the floor thereby earning herself an early exit from Connect. Tomorrow Janet is moving home! Needless to say she is very excited, as am I, and most of our time together today was spent getting ready for her departure. Brian stopped by right after nap time and Janet attempted to show him her picking up technique but wasn’t quite able to get it so she will make another attempt in the morning at making it official. The result won’t affect her coming home as that’s already been awarded to her so there’s no pressure. While we were packing we had a surprise visit from our friend John. He finally got into the care facility he was hoping for just down the road from Connect and seems really happy about it. His move plays into Janet’s plan to help Debra with her Speech quite well as now we can come out and visit John at the same time. Janet asked Debra this morning if she’d like to do a little singing with her and she though that was a great idea. I don’t think Janet will want to start going back to Connect for that too soon but she is quite excited about helping Debra out. Earlier in the day Tez had Janet do two six minute walking tests. The first one was using her cane and Janet went 95 meters. The second was freestyle and Janet made it 101 meters that time. She is very pleased to have made it over a hundred and that is a nice result to take to H2O for the next phase of her physio therapy. Packing her stuff and removing decorations from Janet’s room was a bigger project than anticipated but she was very happy to help and excitedly told Heather on the phone that everything was off the walls. She did a great job separating things and even managed to donate a couple of items instead of throwing them out. We studied a little of Janet’s SheLife materiel before Games Night where Janet engaged more than usual knowing this was her last one. When I mentioned that it will be hard for me to say goodbye to the staff Janet instructed me to “just go, bye bye” waving your hand as you say it. I know she appreciates them all and will say proper thank you’s soon but all Janet can see right now is getting out of there. As I said goodnight tonight she was like a little kid on Christmas Eve, super excited that it was her last sleep there, so much so, I’m not sure if she’ll actually sleep. Tomorrow is the day we’ve long been working for and Janet deserves it to be happening now. I pray that she rests well tonight and enjoys her last visit to the Connect gym in the morning and that her homecoming is as special as she believes it will be. She believes! Janet finally has some confidence towards getting to come home for good this week. Something clicked today and she made huge improvements in her ability to pick something up off the floor. Chelsea took her into the den at Connect tonight for a half hour and practiced with her. Janet says that helped a lot because she really likes Chelsea. I did a lot of the same drills with Janet this weekend but I guess she doesn’t like me. She seems well on her way now and I’m confident that tonight is her second to last sleep at Connect! Our day started early today which was really good practice for when she’s home full time. I had to be out by 8:15 which meant Janet needed to be up and dressed before then. She had to be out by 9:40 which meant breakfast needed to be finished as well. There was no problem getting up, Janet did her own thing after I helped with her AFO, shoes and splint. When I got back from my appointment at 9:15 she was finished breakfast and was proudly emptying the dishwasher. Love it! After Janet’s appointment we made the drive to Connect during which I tried to motivate her to try her best at making this one of her last few days there. She wasn’t sure she could do it but sure worked hard once there. Almost immediately Janet went for a bike ride and set another personal record and even acknowledged that she’s getting stronger about half way through the ride. I took her out for lunch after that and we enjoyed a real nice hour doing that where Janet walked well and talked well, ordering her own lunch and making a lot of decisions in the process. Never once did the server have to ask Janet to repeat or explain. Following a well deserved nap Janet took the initiative and set the dinner table then worked with me on making a salad. I played a few tricks on Janet to get her to pick things up off the floor and each time she new I was being “mean” but she made strong and successful efforts each time. After working with Chelsea I can say that Janet can consistently pick up her cane from the floor as well as her jacket. She’s doing so well that we may not hold her to being able to pick up her phone but she may just get it anyways. To round out her evening Janet agreed to walking the stairs and commented as she was doing so that “I’m going way faster”. Yes she is. Janet listened intently as I read from the book we are currently reading, A House in the Sky, then excitedly said “I’m coming home!” as I said goodnight. The light is very bright at the end of the tunnel and its not an oncoming train, its Janet’s bright cheery home that she is about to actually live in. Praying for a good night of sleep and a day filled with confidence and accomplishment tomorrow. Janet is home for an extra night this weekend as she has a doctor appointment tomorrow morning so this will be a short update. The last few days have been very positive for Janet. Friday we hosted our wine club and Janet said it was a lot of fun, more so than usual but not because of the wine she drank. She said she just felt more relaxed and able to contribute. Saturday of course was baptism day and that was amazing. I’ll give more detail as soon as I can link you to some video of it, hopefully tomorrow. Janet had a large cheering section, including Cam, and her testimony and courage had a positive impact on a lot of people. Today was pretty chill watching football with Cam and walking to Urban Fare for lunch with him. Janet tolerated the minus three temperature better than Cam and this is the third time we’ve been able to walk in the cold. I think as long as its sunny and not windy we can still go out. Nice! Not much progress has been made on the picking things up off the floor front but we’ll keep trying. Its just a fear thing. Praying for a good night of sleep and a productive Monday.